Perfect For: Big Groups Day Drinking Late Night Eats Lunch Sports! There are more sports bars per square foot in Midtown East than there are anywhere else in NYC. We'd suggest avoiding 99% of them like the plague. So if you want to eat some good food, drink some good drinks, and watch Sports On TV in a civilized environment that's not a brotastic steamfest, there aren't a lot of options in the area. Hudson Malone is the 1%. Hudson Malone is a new-ish pub with a throwback vibe, an extensive menu, and an incredibly accommodating staff. It's a big, bi-level space that's certainly TV watching friendly. And they actually take their food seriously. Case in point: there's a custom Lafrieda blend burger on the menu and the owner that spent years running the bar around the corner at PJ Clarke's. They also love whiskey, and have a really nice selection of single malt, rye, and bourbon, including Pappy Van Winkle, which isn't even the most expensive neat on the menu (it's Michters 25 year rye, for inquiring minds). Sold yet? We love hanging at Malone, not because the food is going to change your life, but mostly because all the people who work here are incredibly friendly. From the maitre d', to the bartender, to the servers - everyone seems happy to be here, and eager to help you enjoy your experience. Positive vibes are contagious, and happy employees generally yield happy customers. 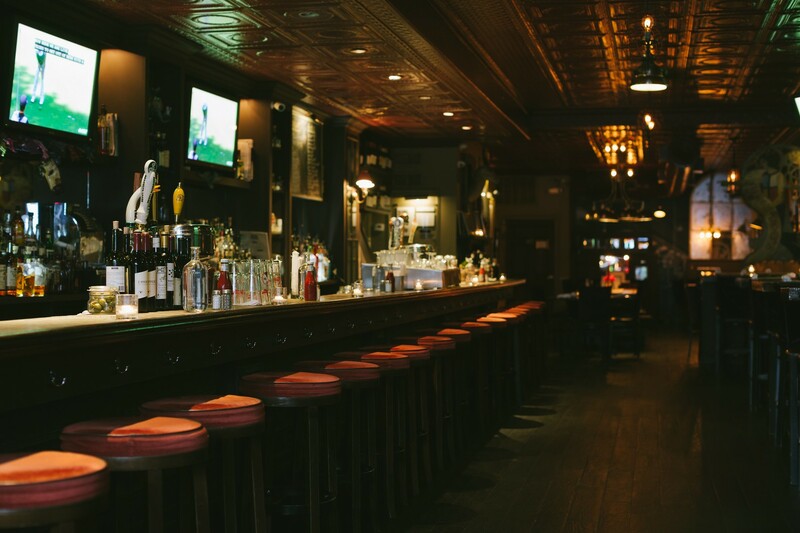 Hudson Malone left a great impression on us, which is way more than we can say for any other sports bar type of hang in Midtown East. Next time you need an afterwork pint and burger, this is the move. A pub with raw bar? Sign us up. We'll have all of your oysters. And maybe a shrimp cocktail, too. When you come to Malone, flex on some mussels. They make an exceptional pot, particularly due to the white wine and garlic "East Side" sauce that tastes like caesar dressing in the best way possible. A skillet of mac 'n cheese, spinach, pancetta, and breadcrumbs. You won't be disappointed. A straight forward burger, with lettuce, tomato, and onion on a soft potato bun. The custom blend Lafrieda patty is all kinds of juicy and packed with flavor. It gets the job done. Also, the fries are pretty amazing. Listen, this isn't the best fried chicken in the world, but after a couple drinks, or a long day of work, you can do way worse on 53rd Street. The sleeper on the menu is this massive pork chop. Don't snooze on this massive hunk of juicy swine. If you're hungry, this is the move.